ROM had a similar, yet not as world renowned, origin as Transformers. He was one of those children of the 80s who was created initially as a toy (while ROM’s limited popularity was in the early 80s, he really was created in the very late 1970s). To promote the toy, a comic book was created. For Transformers, it was the holy trinity for prepubescent boys: toys, comic books and cartoons. For ROM, it was only toys and comics. Which makes ROM one of the lesser-known 1980’s offspring. But IDW has brought ROM back with his own comic for the new millennium. In ROM’s initial comic run, it was Marvel Comics who put ROM on the comic book racks in December, 1979 and lasting until 1986. Now, cashing in on nostalgia and an interesting story concept, ROM—that silver clad spaceknight—is back in all his shining glory. 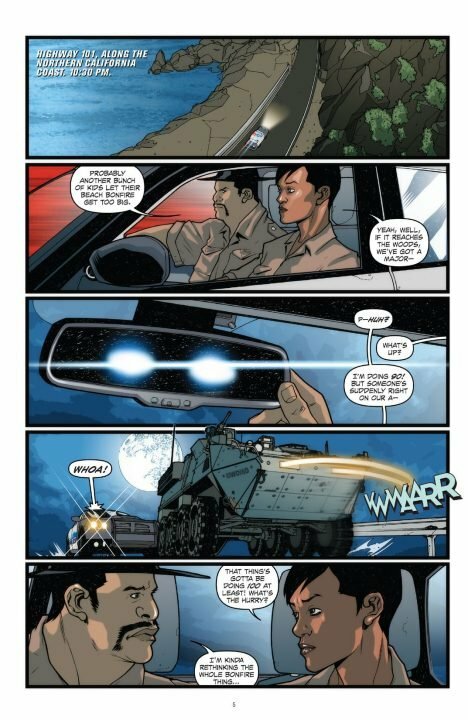 The IDW comic, aptly titled ROM, begins with two police officers who stumble upon an armoured transport and find the landing site of spaceknight ROM. Following most military protocol in movies and TV shows, instead of brokering peace, they want to destroy ROM. But ROM has other ideas; he is here on Earth for a greater cause. Using his Energy Analyser, he opens a red beam—exposing who is true friend and foe. For on Earth, there is an infestation of Dire Wraiths, evil creatures that look and act like humans but are here to control the planet. 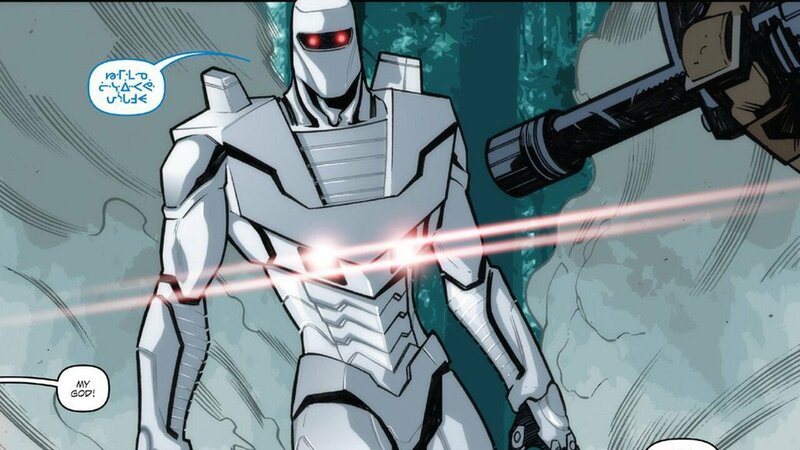 ROM’s story arc follows issues #1-5 and is an above average comic series. For this reviewer, what brought me to pick up ROM #1 was simply nostalgia. I remember owning a few ROM comics from the 80s, and it was bizarre enough to bring back some fond memories. 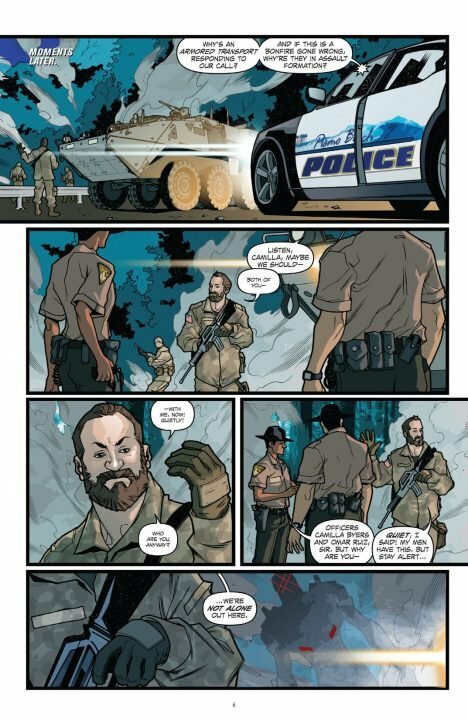 Writers Christos Gage and Chris Ryall definitely are relying heavily on the past to get readers into the first issue. From there on, it’s up to the storytellers to craft a quality tale. All in all, Gage and Ryall create a solid story. The Dire Wraiths have infiltrated most of human society and ROM must utilize his unlikely friendship with two women to try to eradicate such evil. The action is intense, the comic series contains a quality villain (although alien invasion living amongst us isn’t too original), and the plot only bogs down on a few occasions. What holds ROM #1-5 back is the dialogue. It could have been more sophisticated and witty, especially for the readers of the 80s era. It feels like writers Gage and Ryall were trying to write to a broader audience, but for this reviewer, it was a detriment to the series. Artist Paolo Villanelli brings ROM back to life with much of the same look he had in the 80s. While Villanelli’s style isn’t for this reviewer, it never detracts from the enjoyment of the story and the action sequences are well crafted. Perhaps the most intriguing artwork in the ROM series thus far has been the multiple covers per issue. To say the least, many are simply dazzling and create a problem in buying just one. ROM #1-5 was worth reading if for nothing else than to get back a piece of the past. Hopefully, as the series continues it will build on its successes in these first five issues and create something uniquely its own. ROM #1-5 offers a solid start to this nostalgic spaceknight from the 1980s.